Ian, Sebastian and Jag met in our Burnaby, BC headquarters in August of 2017 where we finalized as much of the roadmap for 2018 and beyond as possible. We have been approached by a number of large companies to solve problems through blockchain based applications. Some solutions we could not implement on Syscoin as it is today, so we’ve been working for the last six months on a solution to service these market-driven requests through a single platform. We now have a flexible and scalable design that is uniquely different from existing solutions in the blockchain ecosystem today. With these innovations the platform can serve a large market with nearly infinite use-cases, and full API functionality. We have designed the infrastructure to retain the security properties of the blockchain while scaling to the requirements of market-driven needs being communicated to us through large companies who’ve engaged us. We are beyond excited to have begun development on a platform that will solve many of the unsolved problems in today’s crypto-currency landscape and tie them into our core Syscoin infrastructure. The first step to solving many of these problems hinges around the creation of a Bonded Validator System (often referred to as masternodes such as Dash’s Masternodes System). 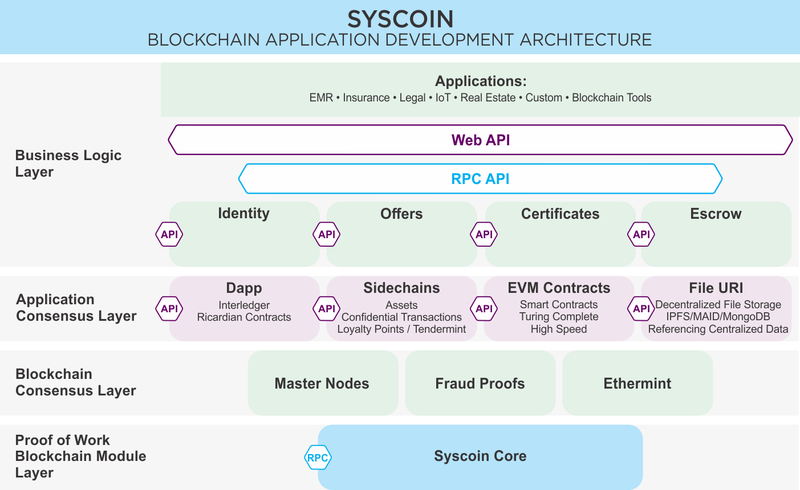 Our design includes a fraud-proof mechanism via a custom masternode implementation, an added Sidechain capability, EVM compatible scalable smart-contract solutions, and a general purpose decentralized application layer allowing for millions of state transitions per second to be recorded on the Syscoin blockchain. Paul Sztorc, the inventor of modern day prediction markets, wrote an interesting article relating to Proof-Of-Work(POW) versus Proof-Of-Stake(POS). He gives an in-depth breakdown on how POW is always cheaper in the game theoretical sense over POS but suggests that a system that combines POW with POS may be the ideal crypto-currency solution if done through the right incentive mechanisms. Since masternodes are classified as a bonded validator system (where you must hold a certain number of coins as bonds to become eligible for a percentage of block rewards and some service fees) it classifies as a type of POS. However, tying it into block rewards which are mined through POW gives us the ability to tie both concepts together and allow us to create a system with the right incentive structure to be able to solve the traditional issues with POS while leveraging the scalability enhancements it brings. Syscoin 2.2 Core which will power Blockmarket Web will come equipped with a masternode system. We have already integrated the masternode system into the core stack of Syscoin and are looking to further integrate with Blockmarket to create the first zero-download web wallet capable of leveraging masternode services. We have been researching how we can unleash the power of bonded validators to solve some of the more critical problems we are facing today including a scalable sidechain design that will break-through the wall that Bitcoin core developers have hit because Bitcoin is not in the same position as Syscoin to leverage such concepts to solve the problem. SPV proofs and Federated Pegs are the only way sidechains will currently work with Bitcoin, both have problems which stop them from becoming usable. We will offer a new solution through a custom masternode service layer which remains decentralized and censorship-resistant. As a pre-requisite to solving that problem we will engineer a new masternode system that will allow us to more efficiently address some of the issues that Dash’s masternode system has in regards to solving these types of problems through consensus. It will be a general purpose fraud-proof mechanism that will allow people to “flag” masternode owners that are not acting honestly by providing a proof that the Syscoin blockchain will use to remove these masternodes from contention of receiving block rewards. We apply a non-punitive policy whereby funds are not slashed but, through cost-benefit analysis, actors are suspended from receiving rewards and fees related to services. Probational periods are then applied to remove the ability for actors to remain dishonest. In conjunction with Adrian Brink, developer of Ethermint, we are working to bring EVM smart contract capabilities to Syscoin through a sidechain bridge which will be compatible with all of Ethereum’s tools and processes. This will give the ability for Syscoin holders to transact in Ethereum smart contracts solely by using their Syscoin for gas and transaction costs through a scalable smart contract mechanism that would allow a masternode service to run contracts while verifiers simply check state through the Tendermint consensus engine. Tendermint is capable of providing transaction finality within 1 second and 10,000 transactions per second. This will also be a customized solution that will be developed in conjunction with the Tendermint team members to realize the goal of a scalable EVM capable platform without any scalability concerns. A non-smart contract layer which does not affect the UTXO-set of Syscoin is also a market-driven need. Things like Syscoin certificates and to a certain extent a majority of the offers in our marketplace are non-smart contract mechanisms that can be transformed into highly-scalable, high-throughput system applications through merkle-tree root hash storage in Syscoin’s POW blockchain. In conjunction with decentralized data storage, we will be able to process millions of these pseudo-transactions per second which represent states in these applications that indexers would reveal through a user-interface. This is very similar to what Factom and Tieron have created (through their chain-point specification) but benefiting from our fraud-proof mechanism to create a more decentralized system. We are working with the Archival and Information Studies department head at University of British Columbia to define and gather requirements as to how to present data and relate it to a general-purpose decentralized application layer. Decentralized data storage, similar to the Filecoin IPFS concept and BigchainDB, will be possible through the use of our fraud-proof mechanism.This will create an incentive driven contract approach to store and serve data through pinning to provide reliable and accurate data storage accross the Syscoin ecosystem. We will, for example, store the Merkle-trees of each block (and the application contract state for each state contract) off-chain, but immutable by rooting to the blockchain. Our customer’s requirements also require linking to existing centralized databases and file storage to comply with existing customer infrastructure while we continue to work toward the blockchain implementation of their projects. Because of our open-ended masternode implementation in V2.0 we will be able to solve problems like keeping return on investment (ROI) static even as more masternodes enter the system. Currently in the initial implementation of masternodes we will require 100,000 SYS to be posted as a bond. If however, more masternodes join, the ROI of existing users is reduced. With the ability to track changes in masternodes through consensus, which is a required pre-requisite to our fraud-proof module, we are also able to ensure that ROI of masternodes remains at a fixed percentage (perhaps set by governance vote). This way even as rewards end and the network relies on transaction fees, the ROI may remain constant by the network adjusting the required bonded amount dynamically to keep the ROI consistent over time. In order to incentivize masternodes to maintain honesty, we are also exploring giving V2 implementation masternodes greater ROI based on the amount of time they have actively been a masternode. You can think of it as a form of seniority. This way we can keep the reward portion of the block the same but shift the ROI portions from the newcomers to reward those that have been around longer and are providing good service. All of our current services on Syscoin will be migrated over to either a smart or “dumb” contract based on the specifications of that service. We’ve completed the initial Masternode V1.0 implementation to be released in conjunction with Blockmarket Web. Our next steps are to re-engineer the system enabling two-way pegged sidechains, scalable EVM smart-contracts and dumb-contracts through a merkleized application layer rooted to the Syscoin blockchain in conjunction with a decentralized data storage mechanism all made possible by offering incentives to keep actors honest through fraud-proofs.